Due to renew your registration this year? 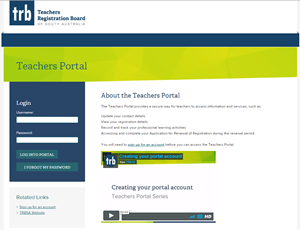 All renewal applications are now done online through the Teachers Portal. If you are due to renew this year and do not have a portal account you will need to set one up as soon as possible. This will ensure you have access to your renewal application as soon as the renewal period commences in October. Watch our step-by-step guide to setting up a portal account or sign up for an account here. The portal is also a safe, central location to store your professional learning. Compiled by former teacher, Jeff Daniels, Running Repairs for Your Writing is a quick and easy reference tool to check your grammar and improve your writing. We have a copy to giveaway to whoever submits the funniest or strangest grammar fail they’ve come across. For more information about the book email Jeff Daniels. Jolly Phonics, 9:00am-4:00pm, Thursday 20 April, $165. All sessions are being held at the EDC, Milner Street, Hindmarsh. More information here. Madhavi Nawana Parker is holding a Toolbox training day which will explore first-hand how to deliver her Resilience and Wellbeing Toolbox in your classroom. Wednesday 26 April, 9:00am – 3:15pm at the Fleurieu Function Centre, 92 Barrage Road, GOOLWA. $297. Bookings must be made by 10 April. Find out more here. To book contact Leanne on 0438 752 877 or email admin@littlelessonsaustralia.com.au. The Australian College of Educators presents Susan Hyde Principal of the Australian Science and Mathematics School talking about progressive educators. On at Flinders University, Level 1, corner Flinders Street & Victoria Square, 5:30pm – 6:30pm free entry. Book by 4 April. Call (03) 9035 5473 or email. How Language Works: Success in literacy and learning - a comprehensive and innovative professional development program for educators seeking to extend their understanding about language and literacy. It assists primary through to senior secondary teachers to improve their students’ learning. Being held in the April school holidays. Click here for more information. ACHPER (SA) is holding their Health and Physical Education Conference Thursday 27 and Friday 28 April 2017 at Immanuel College. For more information contact ACHPER (SA) or click here. Pedagogically Speaking – Technology for Enhancing Learning, a full day workshop that explores ways which teachers can approach planning and resource selection to make sure they get the best outcome for students. Wednesday 26 April, 9:00am-4:00pm, $165, EDC, Milner Street, Hindmarsh. Designing Digital Thinking: An intro to the Digitech Curriculum, a full day workshop that explores what kinds of thinking and learning the Digital Technologies curriculum demands of teachers and students. Monday 24 April, 9:00am – 4:00pm, $165, EDC, Milner Street , Hindmarsh. Pirates. Risktakers. Connectors – the ethics & protocols of the ICT gen cap, a full day workshop that explores the ethics and the statutory requirements of using ICT in your classroom with your students. Saturday 29 April, 9:00am - 4:00pm. More information on the above workshops here. The Hawker Brownlow Thinking and Learning Conference is being held in Adelaide Monday 22 and Tuesday 23 May, featuring Tom Hierck and Dr Dylan Wiliam. The Lakes Resort Hotel, West Lakes. Find out more here.